Nokero International, LLC has announced availability of its ultra-efficient solar light bulb, the N182, billed as the world’s brightest and most affordable LED solar light bulb. Offering double the light output in housing two-thirds the size of its predecessor, the new, trimmer N182 employs the most efficient LED on the market today, a radically redesigned circuit board, and a cost-effective, 1-1/2” micro solar panel to collect the solar energy from which it gets its charge. With a free, 6-8 hour charge from the sun, Nokero’s N182 can provide light for five or more hours, depending on charging conditions. 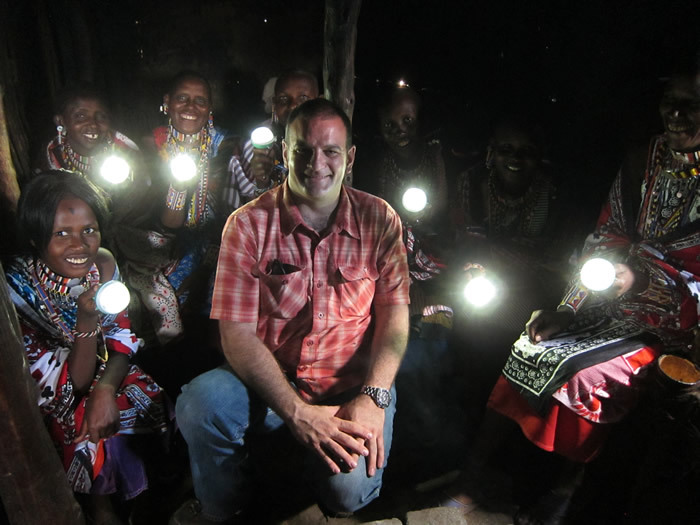 Nokero founder and CEO Steve Katsaros’s solar light bulbs transform free, plentiful energy from the sun into an illuminating force that can profoundly, afforda​bly improve the lives of 1.3 billion people currently living in energy poverty or without access to electricity. “This next generation Nokera solution demonstrates the potency of powerful collaborations,” noted Nokero founder and CEO Steve Katsaros. “The incorporation of Seoul Semiconductor’s ultra-efficient mid-power 5630 LEDs into Nokera’s smaller, more versatile N182 solar light bulb is a game-changer. It transforms free, plentiful energy from the sun into an illuminating force that can profoundly, affordably improve the lives of 1.3 billion people without electricity. Product innovations like this matter because every increase in efficacy translates into longer run times and increases in brightness. This allows businesses to stay open longer, children to study longer, families to recreate more safely in areas without electricity and medical personnel to better providehumanitarian aid in event of a disaster. The possibilities are endless,” noted Katsaros. 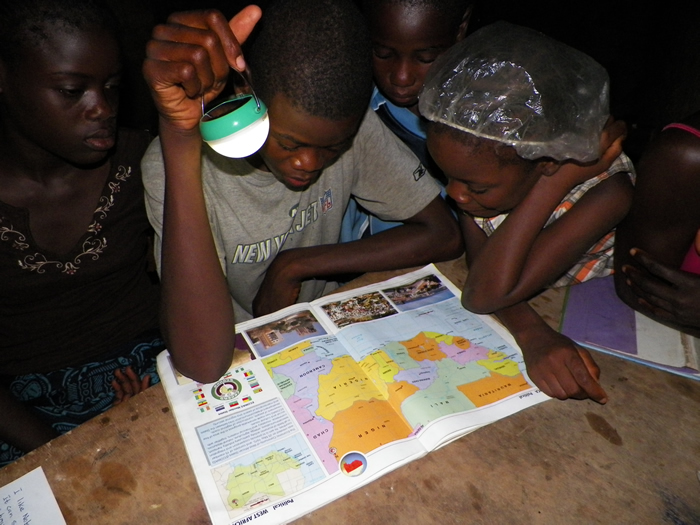 Studies show that introducing Nokero’s solar light bulbs to off-the-grid communities like this household in West Africa drives a greater enthusiasm for learning after the sun sets – and higher test scores! 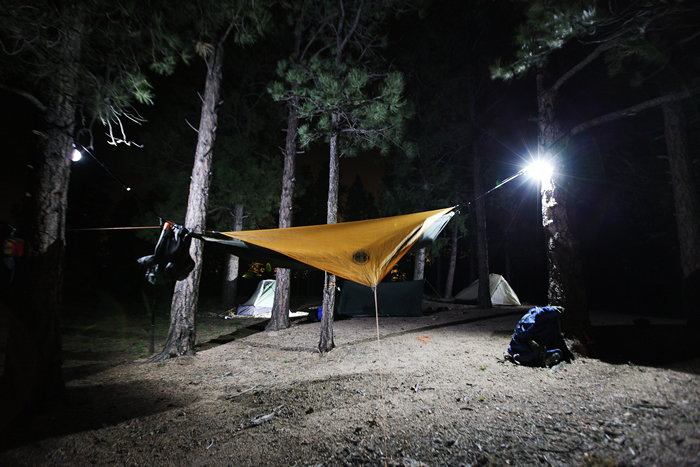 The patented, pocket-sized N182 housing is configured so that it may be used as a hanging light, a standing task light or personal flashlight. The design emphasizes ease of use and efficient energy conversion; at the request of consumers and distributors, the PCB and on/off switch are inside the light’s globe, which keeps them affordable. Nokero’s launch of the N182 solar light bulb commemorates both the four-year anniversary of the company and its recent designation as one of Colorado’s Companies to Watch in 2014. Katsaros is introducing the N182 solar light bulb while discussing its attributes and applications at today’s Colorado Energy Expo. 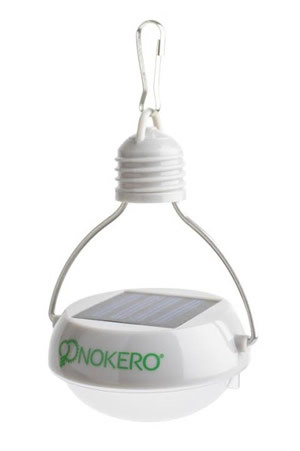 Nokero’s N182 is the world’s most affordable solar light bulb. Its patented, pocket-sized housing is configured so that it may be used as a hanging light, a standing task light or personal flashlight. Nokero is a privately-held company headquartered in Denver, Colorado, USA with offices in Hong Kong and Kenya. Nokero’s name originates from the phrase ‘No Kerosene’ – evoking its mission to replace this harmful, polluting fuel oil (used in many developing countries and off-grid communities) with safer, more environmentally-friendly renewable energy solutions. Its credo is to ensure people throughout the world have access to cleaner, higher-quality and more consistent light after dark regardless of economic status — or proximity to a power grid. 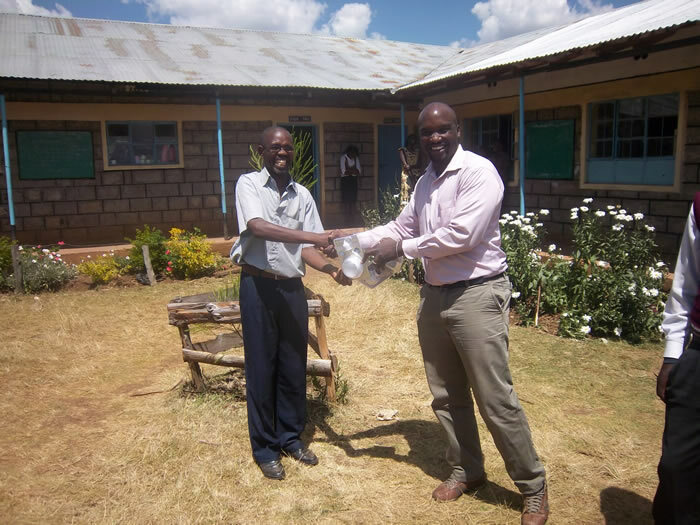 Since its 2010 inception, Nokero has worked with governments, NGOs and corporate partners to distribute over 1 million solar light bulbs to improve the quality of life for energy-impoverished people in 130 countries. But Katsaros says Nokero is finding enthusiastic consumers and distributors in Westernized society as well. Sowing seeds of entrepreneurship for the energy impoverished: Denver-based Nokero is currently building a global distribution network to make its evolving suite of solar light bulbs available to virtually everyone under the sun. Nokero also has offices is Hong Kong and Kenya. Earlier this month, Nokero’s N182 was showcased by LED partnerSeoul Semiconductor at LIGHTFAIR® International (LFI), billed as the world’s largest annual architectural and commercial lighting conference and trade show. It was also recently introduced to emerging thought leaders at the global Sustainable Brands Conference in San Diego. Since its 2010 inception, Nokero has worked with governments, NGOs and corporate partners to distribute over 1 million solar light bulbs to improve the quality of life for individuals – and entrepreneurs eager to empower their communities with the gift of light — in 130 countries. The N182 solar light bulb available for public consumption via the Nokero online shop for an MSRP of $8 each. The company says quantity discounts are available for purchases by the case (60 units) or more. Those wishing to purchase samples of the N182 solar light bulb can find them at Nokero’s online store: http://store.nokero.com or by calling 1 (303) 991-9871. Nokero is currently building a global distribution network to make its evolving suite of solar light bulbs available to virtually everyone under the sun. 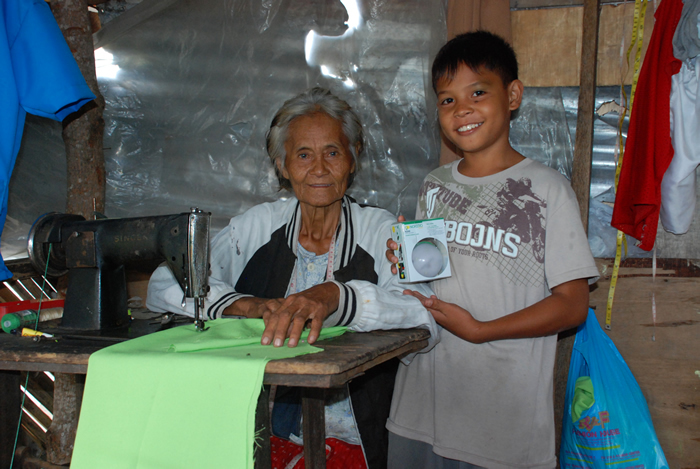 Those interested in Nokero distributorships, product customization – or in gifting Nokero lighting to those living in energy poverty — can see the light at www.nokero.com. With an MSRP of only $8 each, consumers are also inspired to use Nokero’s solar light bulbs for a creative range of outdoor activities where traditional power sources may not be readily available, including camping and biking excursions, beach and pool parties, garden and networking events and weddings. Nokero claims the N182 light is the brightest and most affordable product of its kind. The quality, portability and affordability of this light allows it to be enjoyed world-wide by a plethora of communities in need of off-grid and sustainable solutions – those who without products like this would simply be left in the dark.